Today’s review is, admittedly, a little bit of a departure from the sugar-laden, corn syrup-infused devil food usually reviewed on this weblog website. But this stuff is so good, I couldn’t resist. This is a bag of Sahale Sing Buri Nut Blend. It was given to me by my coworker, and friend of the blog, Charles the Computer Guy. We spend a great deal of time in each other’s vicinity, as I have a monopoly on our school’s computer lab because most of my fellow teachers abhor anything that involves a cursor or electricity. Most recently, we’ve been enjoying complaining about the horrid food served to us at our Christmas party, held at local crap beach bar, Jimmy Guana’s (classy name already, I know, but Jimmy Guano’s would be closer to the truth). I digress. This snack is fairly healthy. I know this because Charles is fit and skinny as a rail, whereas I am more shaped like the drum on the back of the concrete truck that would pour the foundation for said rail. 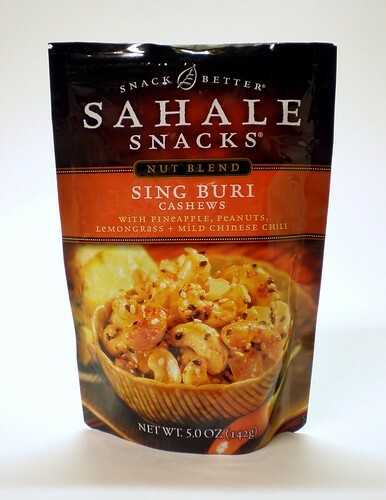 Sahale Sing Buri Nut Blend is an all natural product and contains a pleasant mix of cashews, peanuts and pineapples, all dusted with Chinese chili (whatever that is), lemongrass, and black and white sesame seeds. While I am generally not a huge nut snacker, I will occasionally indulge in a bag of mixed something or others. More accurately, I usually enjoy eating the raisins and M&M knockoffs out of whatever substandard bag has landed itself in front of me. This stuff, however, is really, really good. 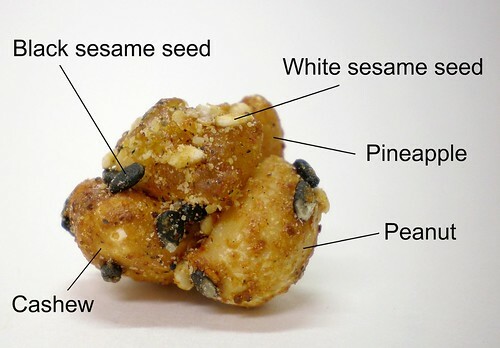 The cashews, peanuts, and pineapples (my favorite fruit incidentally) work really well as a whole. The lemongrass and Chinese chili give the mix a nice unifying theme without being overpowering. The flavor calls to mind the smells and flavors found at your local Thai restaurant. Sing Buri is a province in Thailand by the way. Also, missing, is the ton of salt present in other awful nut mixes. So I am not left with the sudden spike in blood pressure and self-loathing. I am intrigued by this bag of delightful flavors. 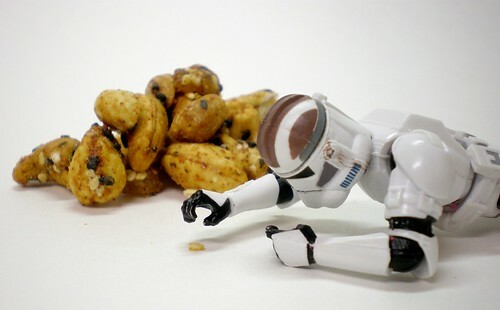 I offered a handful to some fellow snackers, and they were not fans. 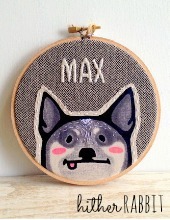 I can see how this might not be popular with everyone. The flavors are not encountered everyday, especially not in bite-sized snack form. I would definitely drop this into the regular rotation though. It’s different and pleasant and satisfying. Go grab yourself a bag. 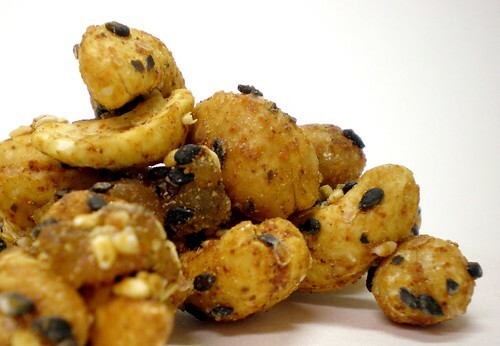 Sahale offers four other nut blends with flavorings from different parts of the world. I may just have to take a trip down to the Whole Foods and pick up some more. I’ve already stopped bathing. They are indeed! I can’t believe I didn’t know about them until now. this sounds awesome. pineapple+crazy chinese spice… that sounds like an equation for success. They are indeed! Highly recommended. cost of plastic bags, and looks like it is more than a cent.